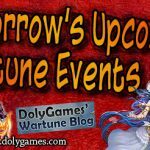 Hey everyone, in this article I share the Wartune Events for the 18th of August 2018 (article + video)(Gem Synthesis & Soul Engraving Cycle). This event cycle offers chance to upgrade Gems, do Soul Engraving and Identify & Refine clothing. Gem Master – 3 days: rewards for owning specific number (10) of Gems from Level 6 to Level 12. Clothing Engulf – 3 days: Raise clothing level. One time ever rewards collection. (was expected, maybe removed) Advanced Henna #1 – 3 days (Daily): During the event, advance cleanse tattoos X times to receive rewards. (was expected, maybe removed) Advanced Henna #2 – 3 days (One Time): During the event, advance cleanse tattoos X times to receive rewards. Most trades of this exchange are not interesting. Maybe only consider 100 Talent Stones for 100 mini-items. anniversary event is over, I do not see anything about it anymore and there are still 6 days left to finish, you know anything COSMOS? Hmm… was expecting another cycle of anniversary stuff. But nothing. They have another week of them, but only coin piles are left. Really poorly thought out, if that’s it for anniversary events. Should I use cast stones or save it ?